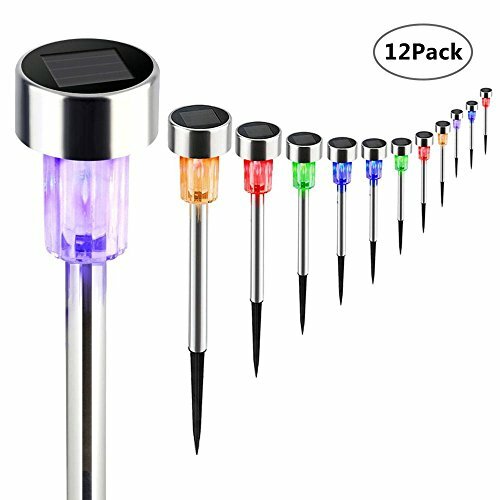 Aolvo Solar Garden Lights, LED Solar Panel Lights Outdoor Garden Stake Light, Waterproof Color Changing Solar Lamp for Patio Yard Garden Driveway Pathway Landscape (12 Pack) | Fountain City Art Ctr. - The solar panel is on the top of the lamp, converts sunlight during the day and charges the battery. At dark or night, the lights will be turned on automatically and can last for 8 hours or more. - Under gradually color changing mode, it creates fantastic and romantic atmosphere. However, under the single white color mode, lights have a good illumination effect that is very comfortable. - Perfect for your garden, park, porch, patio, deck, frontyard, backyard, pathway and driveway etc. The garden solar lamps bulb is good for adding colors to your outdoor landscaping area. - Size: 23 x 13cm/9.05" x 5.11"
- If you are not completely satisfied with our Solar Garden Lights just contact us, we will try our best to give you a satisfactory solution! [DECORATIVE LANDSCAPING LIGHT] - Decorative Solar Garden Lights are the perfect addition to your fairy light, gnome statue & fountain mosaic! Add color to your outdoor landscaping area. [COLOR CHANGING] - Unique design with color changing function. Solar Garden Lights cycles through a symphony of colors automatically from dusk or switch to constant white light. [WEATHUER RESISTANT] IP65 waterproof. Heatproof and high brightness. The garden lamps are designed to withstand sunny days, rainy nights, and snow. Excellent performance under most weather conditions. [ENERGY-SAVING SOLAR LIGHTS] Using energy-efficient LED illumination, these outdoor solar landscaping lights remain cool to the touch and can illuminate vibrantly for up to 8 hours or more once fully charged. [EASY INSTALLATION] Easy installation and maintenance, no wiring required. Super easy to set up. Simply push the stake into the ground. It just takes a few seconds. Suitable for the garden, trees, flowers, flowerbed, patio, walkway, fence, this solar pathway lights does it all.